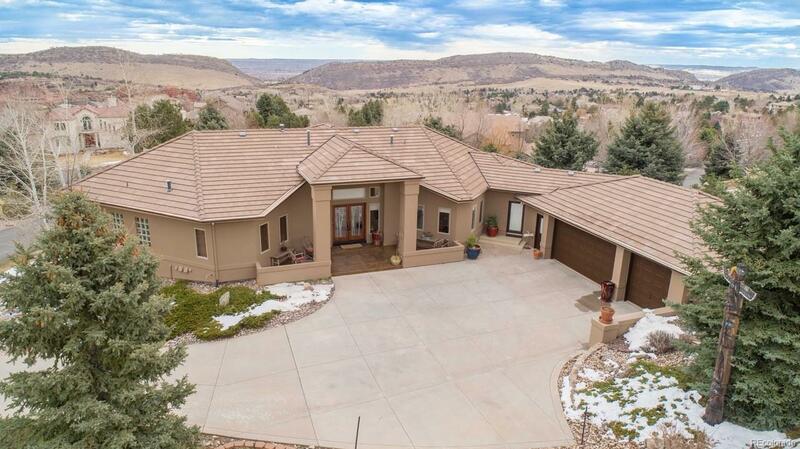 Luxury ranch home in Willow Springs with Foothills views from the east facing side and private mountain views to the west. Recently enlarged windows and glass doors fill the home with natural light from one end to the other, and Hunter Douglas blinds are included just in case. Enjoy championship golf at Red Rocks Country club, a short golf cart ride away, where you can also enjoy swimming, fine dining, happy hour and more. Subzero kitchen with chiseled-edge granite and gas range. Recently remodeled master bath is elegant with Japanese soaking tub and steam room. New paint inside and out, as well as new carpet throughout the basement. This home features a private front porch that faces over 800 acres of private open space with over 16 miles of well-maintained hiking and biking trails. 30 minutes to downtown and DTC, 48 minutes to DIA. A world away, but still just close enough to everything - "The Nearest Faraway Place"